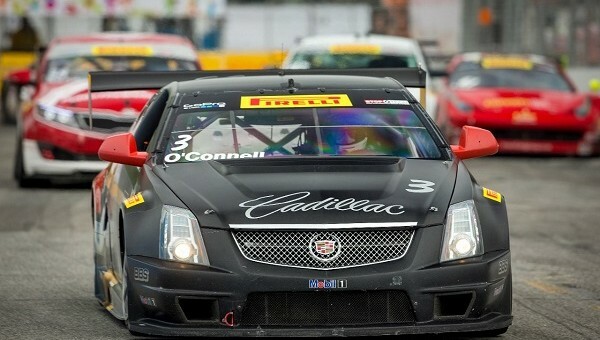 This past weekend’s race on the street course at Exhibition Place in Toronto was crucial for Cadillac Racing, as their CTS.V.R racecar is much faster over the bumpier street surfaces than the competition’s FIA GT3-spec cars and the team could use the extra points. Neither Johnny O’Connel nor Andy Pilgrim got exactly the result they were looking for, but still managed to put the Cadillac on the podium once over the course of the double-header weekend. O’Connell qualified fifth and had already jumped to second position before diving into turn one. Soon after he would hand over his position to Kuno Wittmer, who flew past him on the straight in his Dodge Viper SRT GT3-R and eventually went on to win the race. O’Connell battled to gain two positions following two restarts, and began to feel the pressure from Mike Skeen in his Audi R8 Ultra late in the race. O’Connell finished third, with Skeen less than half a second behind him. Pilgrim had a tougher task in front of him as the green flag dropped after qualifying ninth. Despite some issues with the way his car was set up, Pilgrim managed to gain three positions on the tight road course to finish sixth. Pilgrim also voiced his frustration about the team’s lap times during the race. The CTS.V.R has typically been faster than the more aero-intensive GT3 cars on the street courses. Now, the team will have to work extra hard to earn points at the remaining road courses, where the GT3 cars can really shine. Things didn’t get better on Sunday, either. Pilgrim was the fastest Cadillac finishing fifth in the No. 8 CTS-V.R. O’Connell meanwhile trailed in eighth. The race was won again by Canadian driver Wittmer in his Viper SRT GT3-R, followed by Anothony Lazarro in his Ferrari 458 Italia GT3 in second and Skeen in the R8 in third. O’Connell is currently leading the overall driver standings with 1038 points to second place Skeen’s 930. Cadillac is also leading the manufacturer’s standings with 67 points, but is being closely stalked by Audi with 60 points.